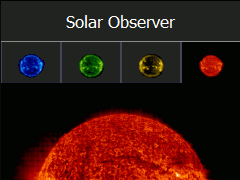 Our new app Solar Observer shows latest images from our sun. You can switch between the images to see the sun in different spectrum. Available now for free for Asha phones: Solar Observer in Nokia Store. This entry was posted in apps and tagged Asha, ESA, freeware, Nokia, science, sun by meier. Bookmark the permalink.